Warning: there are spoilers within this review which you may not want to read if you haven’t read the book. Ta. 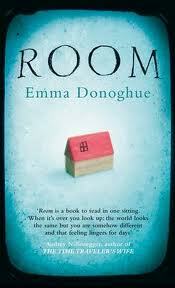 Room is the seventh novel by Irish-Canadian Emma Donoghue (thank you, wikipedia). Five year old Jack tells his story in the first person throughout the novel. Aside from the young narrator, the other interesting part of the novel is the knowledge that Jack lives in Room. Room holds everything Jack could ever need, including his Ma. The only blot on the landscape is Old Nick, who visits Ma when Jack’s asleep in Wardrobe via Door, whose code you need to know to get out. It might not be a surprise to learn that this is based on the five year old boy from the Fritzl case, without the icky incestuous bits. As far as I could tell (not being an expert on the Fritzl case) this is where the similarities ended, and Donoghue has merely used this as inspiration. When I first read the blurb on the back of the book, I thought that the premise couldn’t possibly support a whole novel. My initial thought turned out to be incorrect, thankfully. Jack and his Ma’s lives within Room are written as claustrophobic and monotonous, filling their days with manual tasks such as hand washing sheets and towels in order to get through the hours between waking up and going to sleep as quickly as possible. Little events take up hours for Jack, such as the leaf that came to visit on Skylight. Usually I get irritated with affectations in novels, such as adopting patois or capitalising nouns, the latter of which is what Donoghue does with Jack. In this instance it makes sense – Jack has only ever known one Room so why would he not load it with importance? I have heard complaints about Jack’s extensive vocabulary, but that is also understandable – they have television and a limited number of books and his mother is there 100% of the time to teach him all of the words and knowledge pockets she knows. Added to that, he is the only other person there to have a conversation with, so it’s no wonder his speech is more mature than for the normal five year old. Similarly, Jack and his mother play a game called Parrot, where Jack listens to the TV until his mother presses the mute button, at which point he has to repeat all of the words he can remember. Normally it is the news, which means that Jack can literally parrot long or politically complex words and/sentences without having a clue what it’s about. Inevitably, a plan is hatched to escape from Room. This relies heavily on Jack, although I won’t spoil all of the details here. He is reluctant to be involved, and pleads with his Ma to let him wait until he’s six. I found that to be the most thought-provoking part of the story – why would he leave his whole world to go somewhere that he’s only just heard about and might be rubbish? This is handled very well in the writing – just enough emphasis on how bewildered Jack is without labouring the point. Although The Escape doesn’t happen until about half way through the book, it doesn’t feel like the story is confined at all. This may be due to the references to Jack’s fantasies and the books he and his Ma read. If were to read it again, or read this with a book club (the popular choice, I think) I’d read Alice in Wonderland alongside it. There are repeated references to Alice by Jack, and it’s quite clear that he is comparable to Alice – down the rabbit hole and trapped in a strange world where nothing is as it seems. Of course, for us we would perhaps assume that Wonderland is Room, but in Jack’s case, as mentioned previously, it’s the world as we know it. Another aspect of the story that I enjoyed was Jack’s perspective on ordinary things, especially in the real world. He dislikes rain and even showers, as he has only ever had a bath. This means that although he is five years old and his literacy levels are advanced, he cannot do basic tasks such as climb stairs. He is also confused about why people keep mistaking him for a girl – he has never had a haircut and wears a big t-shirt which looks like a nightdress, so for us it’s an easy mistake to make, but for Jack it’s unfathomable. Although this book is the first one in a long time that I have read and enjoyed (Wicked! By Jilly Cooper, I’m looking at you) it’s not without criticism. The device of a sole narrator, a five year old one at that, was a very clever one as it added a new slant to a story that had perhaps been seen before. However, it made for slightly narrow chapters as Jack was filtering everything he had seen and heard through his own personality. It also meant that everything was about Jack. Although it was a bold move to retain the narrator for the whole book, I would have liked to have seen more from his mother. The other slight criticism I have is that the book was anti-climactic, despite being very tense in places, I felt that there was always something else, waiting around the corner. Unfortunately, whatever it was did not materialise. Looking back at the last two paragraphs, both of the criticisms are about areas that are absent from the novel, not present. I don’t think it’s fair to judge a book (or film, or anything) on what’s not there as at that point you’re trying to make it yours and not the creator’s. I would recommend Room as a book that is easy to read and yet stays with you for a while. No doubt there will be a glitzy Hollywood film version in production at some point in the near future, but I would urge you to read the book first. No film can conjure the feeling of comfortable claustrophobia that Jack does. I’m also going to see if I can find another of Emma Donoghue’s books to read. PS I have a confession to make. I haven’t finished reading Vanity Fair. I will do at some point though. Pinky swear.